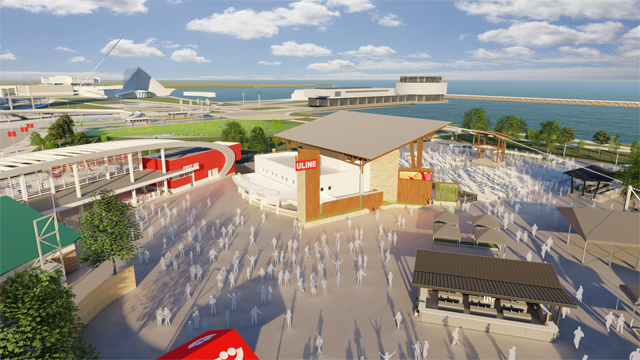 Published Jan. 15, 2019 at 8:20 a.m.
As Summerfest continues its years-long makeover, which includes a new amphitheater, currently under construction, Milwaukee World Festival, Inc. released details and renderings of a new Uline Warehouse Stage. The stage – the face of which is executed in rustic-but-sleek cedar and limestone, both locally sourced, and green accents – is already being built on the far north end of the festival grounds at the lakefront. Last year, a new north entrance and plaza opened adjacent to the site, as did the Klement's Sausage & Beer Garden. Just south, a new U.S. Cellular Connection stage opened, too. The new Uline performance area includes, a larger, reconfigured stage and seating area with expanded lighting, sound and other production capabilities to handle larger touring shows. There will be a new video screen – the first at the Uline Warehouse – to the right of the stage, a new permanent bar, a new and more easily accessible ADA viewing area with improved sightlines, and a service area with information and stroller and wheelchair rentals. The entrance will also be wider to allow crowds to more easily enter and exit the area. 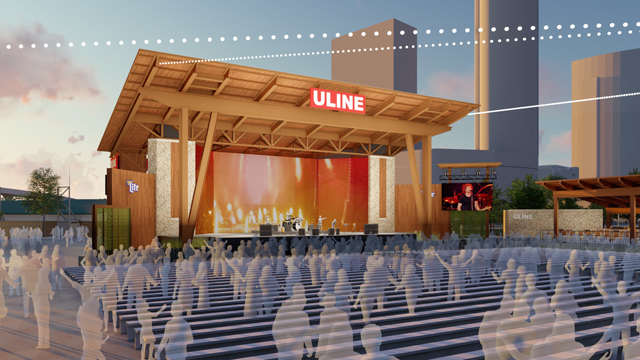 As is the case with all new stages, the Uline – which was last updated in 2003 – is also getting an elevated VIP area with its own bar and restrooms. The new stage was designed by Eppstein Uhen Architects and is being built by C.G. Schmidt. Interestingly, renderings for the new stage show a silhouette of the as-yet-unbuilt Couture project across Lincoln Memorial Drive from Summerfest. 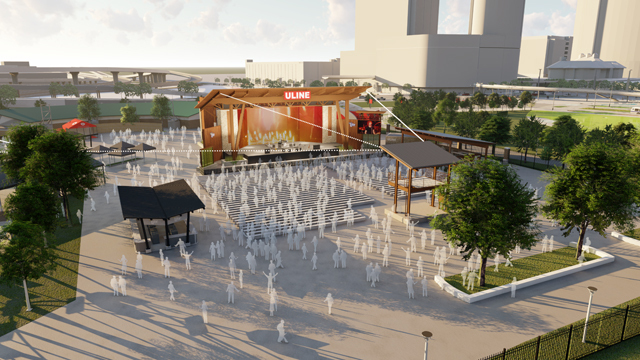 "The new Uline Warehouse will significantly enhance the festival experience for our patrons" said Don Smiley, president and CEO of Milwaukee World Festival, Inc., in a statement issued this morning. "We are grateful to Uline for their ongoing support to maintain Henry Maier Festival Park as a world-class facility. Milwaukee World Festival, Inc. is only able to make these improvements with the assistance of our sponsors." he added. The new stage is expected to be ready for Summerfest 2019.